If you or someone you love suffers from excessive worry, anxiety, panic, OCD, or phobias, you know how crippling it can be. Of course, worry can be an important asset when it forces our attention on problem-solving. But anxious worrying can cause us to unnecessarily focus on a threat, to retreat and avoid, and to seek reassurance and safety—which is no way to foster a life of growth and excitement. In his fifth published book, Dr. Reid Wilson proposes a groundbreaking, paradoxical approach to overcoming anxiety, worry, OCD, panic, and phobias by moving away from comfort, confidence, and security and willingly moving toward uncertainty, distress and discomfort. Through the use of unconventional strategies, readers will learn how to confront anxiety head-on and step forward into the face of threat. 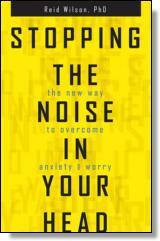 Drawing on a range of sources—from firefighters and fitness instructors to Sir Isaac Newton and Muhammad Ali—Stopping the Noise in Your Head demonstrates the importance of shifting our perspective and stepping toward our challenges in order to regain control of our lives. Where would we be without our worries? How would the dishes get done, children get fed, bills get paid? With all that we have going on in our lives, how would the floors get swept, homework get done, birthday cards get mailed on time? How would we get enough sleep each night unless we worried about not getting enough sleep? Perhaps there's some truth in all that (save the bit about sleeping—I'm fairly certain worry won't help with that). Our worries serve a purpose in our daily lives. They aren't just instruments of torture. When worry plays a role in helping us to solve our problems, it does a fantastic job. (Just like when the almond-to-dark-chocolate ratio is more like 3:1 than 1:1.) So I want you to love worry when it serves you. But when it becomes a bothersome noise in your head, it has no redeeming value and you need to kick it to the curb. I have spent most of my thirty-five-year career working with anxious clients. When people ask what drew me to this field, one of my playful answers is, 'It takes one to treat one.' And I guess that's right. Although I have never had an anxiety disorder, I sure know how to worry. In fact, I am skilled at generating lots of bad feelings alongside many wonderful feelings. I can distinctly remember a moment in college when I concluded that I was likely to be a lifelong expert at generating worrisome thoughts. I figured that the best way to keep track of my own mental health was to make psychology my profession. Various resources helped produce the book you're holding in your hands—investments such as time, research, years of study and practice, drafts, proposals, and perhaps 4,000 cups of various forms of caffeine—and among all of those was worry. My worry shows up in one of two forms: either incredibly helpful . . . or dreadfully bothersome. When I continually remind myself that I should be working on this project, and yet I don't set aside time to focus on it, I use up part of my consciousness fretting because I'm not getting around to the task. I experience a combination of guilt (that I'm not being productive enough) and worry (that I am making a mistake by not addressing the project at this very moment), both wrapped up in a tidy little package padded with a thick layer of self-criticism. When the task is my writing, it sounds a bit like this: 'Geez, I gotta get focused on writing the book. I gotta be more efficient with my time. I gotta stop doing these little productive things and focus on the big productive stuff. And I gotta find a synonym for gotta.' And then, 'If I don't devote time and energy to this, it'll never get done. I waste so much time during the day. I need to start focusing. I should do all of these things today . . . simultaneously.' This is not a loud noise in my head, mind you. It's more like a kind of muttering. It gnaws away at me in the background and brings a taste of unhappiness into my mental palette each day. Here's the other way my worry works, and this I highly recommend. The thought pops up again: 'I gotta get back to working on the book if I'm ever going to get it done.' But this time it's wired into my disposition about this project. It's important to me, I want to accomplish it, and I absolutely want to devote time in the immediate future to work on it. I can use that thought as a signal to move into action. Relatively quickly I shift into problem-solving mode: I decide when I'm going to set aside a chunk of time, and I literally mark off that half day or so in my calendar. But juggling and prioritizing tasks is not smooth sailing for any of us. Worry helps us through the rough waters by motivating us to stay on task and solve problems both big and small in our lives. Very simply, I would not want to lose the benefits of worry. But I also don't want to kick around in the wading pool of worry. I want to dive into the deep end and tackle the real challenges in life. Worry, of course, has long been critical to our survival. Our cavemen ancestors who took leisurely strolls down by the stream, enjoying the pleasures of a beautiful fall morning, were eaten by the saber-toothed tigers (dinosaurs were mainly vegetarians). Their genes were lost. Our paranoid, there-could-be-danger-around-any-corner, defender-of-the-family-tribe ancestors lived to procreate, passing on to us that ever-present protective mode of worry. Some degree of worry is actually good for us, for it can help jump-start us out of our denial, and it can drive us to prioritize our tasks. Most important, worry is designed to be an initial response, as Step One in the problem-solving process. It should initiate our efforts to find solutions by triggering our analytic process: evaluating the current situation, generating response options, choosing among them, selecting one, and then implementing it. When this progression works well, we get to conclude our analysis with a message like, 'I'm worried about finishing this project, and now I'm going to take action. This is how I'm going to get it done—here's my plan.' See, that's the usefulness of worry. We bastardize the process when we operate as though worry is the problem-solving process. We keep naming the problem over and over again without productively addressing solutions. We say, 'I've got to get this done. If I don't get it done, I'll be in trouble. I'm not sure I'm going to make it.' During stressful times—if our steady income seems threatened, if an unfamiliar physical symptom is persisting, if a son begins driving or a daughter begins dating—most of us fret a little too much. It's as though worry becomes our talisman to ward off the trouble, the mistakes, the dangers. We believe that if we can just worry enough, we will come up with ways to prevent the bad things from happening. We feel threatened, so we operate as though all this thinking will protect us from committing any errors of judgment, and that it will ensure we make the right choice. Then once we decide on a plan of action, we worry as a way to verify that it's the right action, which really becomes a process of second-guessing our decisions. But we have it wrong. Worry isn't supposed to solve problems. Its job is to generate problems in the front of our minds so we know what to fix. And it causes us to think more about how things might go wrong than about how to correct difficulties. After all, one way to avoid trouble is to imagine ourselves in that trouble! Imagine you are late for an appointment and driving in a rush. As you approach the traffic light, it turns yellow. You momentarily consider taking the risk of running through the light, because that will save you precious minutes. Then up pops an image of things going really badly for you and others in the middle of that intersection. You immediately act on your instantaneous decision to stop. That's worry at its best. What happens if we don't place our worries within the problem-solving process? When we start paying a high emotional cost for unnecessary worry, and when our worries pop up in our minds too frequently, then those thoughts hurt us. Worry leads to anxiety. The more we worry, the more anxious we will become, whether it's about family, financial issues, work or school, or illness. If we don't address this type of worry and find ways to control it, we will continue to be anxious. And worry will absolutely inhibit our performance. During any project, we should focus our attention on the task. But when our attention keeps getting redirected toward unhelpful worry, we become self-absorbed. 'How will I do? What if I fail? That will be too painful for me. Must avoid failure!' These are compelling thoughts, and anyone would have trouble disengaging from them. But if you want your inner resources available for the activities you value, you need to find a way. That's what this book is for. Yes, worry serves an essential function by helping us solve legitimate problems, and in Chapters 5, 6, and 7 we will discuss that. But through the rest of the book, we will look at times when anxious worrying disturbs us instead of helps us. We are going to study problematic worry and how we limit our successes in service of this dominant challenger. Then I will show you how to win that challenge. ©2016 Reid Wilson. All rights reserved. Reprinted from Stopping the Noise in Your Head. No part of this publication may be reproduced, stored in a retrieval system or transmitted in any form or by any means, without the written permission of the publisher. Publisher: Health Communications, Inc., 3201 SW 15th Street, Deerfield Beach, FL 33442.